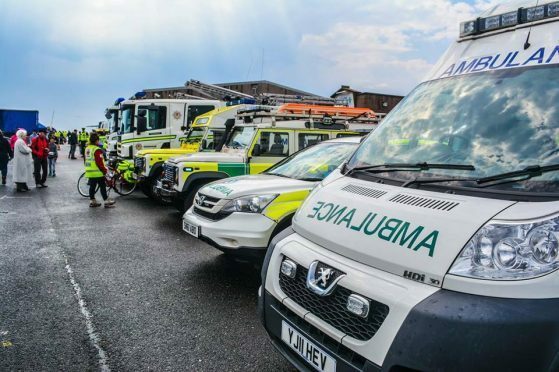 Organisers have hailed a celebration of the north-east’s emergency services, which brought thousands of people to Fraserburgh, as “one of the best yet”. The annual Blue Light Festival returned to the town yesterday with a whole host of activities for local families to enjoy, including life-saving demonstrations. The event brings together all of the 999 services, including the coastguard and local community first responders, at the Fraserburgh Leisure Centre. This year, more than 2,000 people attended the proceedings, which were heralded by volunteers. Last night, one organiser said the attendance was “one of the best in recent years”. Doug Ewen said: “It went well, we reckon there were about 2,000 people here. All the emergency services were here and we did several displays including some fun scenarios. Starting at 12.30pm with a parade of emergency vehicles, the festival included a life-saving demonstration from a marine diver and rescue team, in addition to a joint emergency services display. He confirmed that, although the event was free to attend, any money raised at the stalls would be pooled and distributed to local causes. A diverse variety of local organisations, including the Broch Drama Group, Lochpots School Choir and the local British Legion Band were all on hand to entertain the crowds.